More links for "Racing Series S-Line SL4000 Rev. 2 Gaming Chair - White/Black Edition"
I've been looking for a new chair for a while now and decided to go for the SL4000. My gaming rig is White/Black so this went perfectly with that. It all came in a pretty hefty box and once opened all the parts were very well wrapped. Assembly was pretty straight forward, although I did have an issue with one of the bolts for the base. It didn't seem to line up with the hole once you had the other three inserted. I got around it but was a little worried about stripping the thread off the bolt. Screwing the back rest in place was also a little cumbersome as I could have done with another pair of hands, once one side was attached it was a case of balancing the back while trying to screw down the other side. Last little niggle was the covers for the side bolts. They are attached by a couple of fairly long bolts. I noticed that there were two small holes in the side of the back which once I worked it out were so the bolts could move inside the frame of the back. These didn't match up with the fixings so as I screwed to bolts in I could feel it pierce the fabric of the back. Anyway once built it looks fabulous. I'm very happy with it. Comfort wise I found not having the lumbar cushion more comfortable than having it but I suppose its a case of getting used to it. My only small gripe, apart from the very small issues assembling it is that it seems to rock a little from side-to-side. I'm not sure if its because of the type of chair, where its sat atop a piston cylinder, but its a little annoying. I have tightened all the bolts and made sure it the chair and cylinder are sat in the base OK but it hasn't made a difference. Bought this chair recently as an addition to my gaming setup. 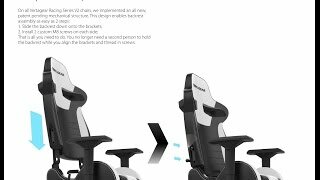 The chair was pretty simple to put together, had a small issue with 1 of the bolts but after contacting Vertagear via email, they sent me a video with a tip on the best way to assemble the base, which resolved my issue. 10/10 for their customer service. The chair looks great and is very comfortable. would recommend without a doubt. Chair is comfortable for the back and also for the posterior. Good value for money too if you shop around. Pros:- Comfortable good solid chair for the all round PC user. Cons:- Bit of a struggle putting together the back part of the chair and fastening it all together.